Carte des Indes orientales I. feuille, dans la quelle on represente les Indes deca la Riviere de Ganges, le Golfe de Bengale, Siam, Malacca, Sumatra dressee par Mr. de Tobie Mayer de la Societe Geograph. 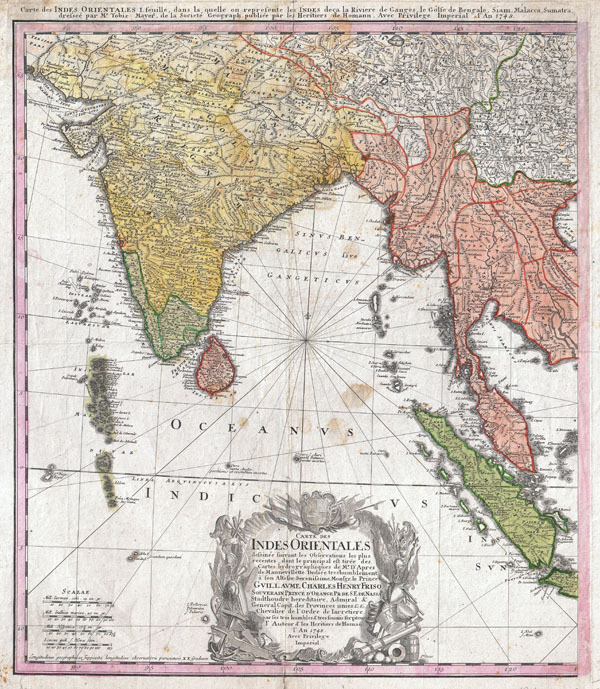 An attractive example of the western sheet of the Homann Heirs 1748 map of India and Southeast Asia. Details the subcontinent as well as much of Southeast Asia, including modern day Burma, Thailand, Laos, Malaysia, Singapore and Sumatra. Extends north to include Delhi (Delly) and Agra as well as parts of Tibet. The apocryphal Lake of Chiamay, a cartographic error common in many early maps of this region, appears in vestigial form near Assam. Portuguese Goa is highlighted. Drawn by Tobias Meyer for the Homann Heirs in 1748. Good condition. Minor verso repairs along some of the original fold lines. Minor spotting and overall toning. Blank on verso. National Library of Australia, MAP RM 2526.